At Mapcon Technologies, Inc., we offer more than just a robust CMMS. We offer many different services to help you learn more about your system, and customize it to fit your individual needs. Training – We are dedicated to offering your staff the best training opportunities available anywhere in the CMMS industry. That's why we offer three types of training (online, on-site, and at our facility) for your convenience! Find out more about MAPCON Training Options by visiting our Training Pages or call us now at 1-800-922-4336! Support – Our dedicated support staff is here to serve you! Every time you call for support, you will be routed directly to the person best suited to fit your needs. And, we do not outsource! Every time you call, you will be speaking with a Mapcon employee, right here in the United States. Too busy to pick up the phone? No problem. We also offer support via email. 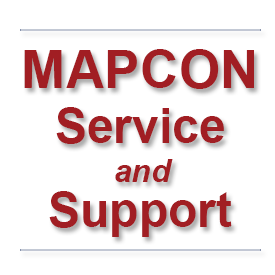 Learn more about MAPCON's outstanding support team! Email MAPCON Support or call us today at 1-800-223-4791! Customization Services – If by some chance you discover something MAPCON doesn't do – let us know! Chances are we can modify your system to work exactly the way you need! Reports, interfaces, screen changes, mobile modifications or whole new modules – we can do it. Learn more about MAPCON Custom Programming! MAPCON Sales or call us today at 1-800-922-4336! The MAPCON Team can get you connected! Interfacing – Transfer data from your MAPCON Maintenance Software directly to multiple other systems. We have an interface module that can be configured to export information from MAPCON at regular intervals. This is normally done for purchasing and inventory information but it can be configured to transfer many types of information. NOTE:* Configuration may require custom programming depending on your specific requirements. Implementation: Let MAPCON Help Get You Going! Implementation – Implementing MAPCON couldn't be easier. Onsite or online, we can assist you in getting your system up and running effectively. We have implemented thousands of CMMS systems and have the knowledgeable staff, with over 150 years of combined experience, ready and able to quickly get your system running as you need it. Let us make it easy! Learn more about MAPCON Implementation! MAPCON Sales or call us today at 1-800-922-4336! Why not Contact MAPCON today!